Assalaam ‘alaikum sisters, and welcome to this article on creating an inspiring life vision. Take a moment to reflect on when you were younger. Someone probably asked you what you wanted to be when you grew up. What was your answer? Does your career or life path reflect the answer you gave then? A child’s imagination allows him or her to be playful, to imagine being more than one thing, to have more than one dream. But as we grow, life’s disappointments begin to taint our dreams. Something doesn’t turn out as we’d hoped and it holds us back from wanting more or even believing that it is possible for us to live how we truly want. Creating a life vision can be challenging because of our internal obstacles, but this just makes it even more critical. If we don’t have a dream, we never have a chance of fulfilling one. It’s as simple as that. Take *Kouther’s example (*name changed for privacy). She was very unhappy when she came for coaching. She had failed her university course in medicine, she had no motivation to keep trying and her family were pushing her to start again. She knew that she hated it, but wasn’t sure what she wanted to do instead. The stress at home was also taking its toll on her health. Through coaching, she discovered that she wanted to make a difference in her life, not through medicine, but through law instead. She mustered up the courage to go back to do the course she wanted, but following her dream had a cost. Her family were still quite unhappy. Yet, she believed in her vision and chose to continue. Over time, she has now built a successful career and is really happy and fulfilled. Alhamdulillah, seeing that she is doing so well, her family have come around and things are getting better between them. Kouther had to face her fears, but having her vision in front of her made those challenges slightly easier to face and she is glad she did. Would you like to have something compelling you to live a bigger life? If so, then read on. Let’s explore a few simple steps to how to get going. So, how do we carve out a life vision, and essentially what is it? A life vision is exactly that: a “vision” or a dream for your life. It represents what you want your life to be about. Your life vision will inspire you towards action throughout your life, even when things get challenging. Your life purpose is the meaning you choose to give to your life. For example, making a difference to the Muslim community through your talent would be something that could call you to action for years. Carving out a compelling life vision requires reflection. The best place to begin is at the end. In terms of a life vision, a compelling one is usually big enough that work would remain even after we are gone. Take a moment to close your eyes and imagine that you have passed on. There is a gathering in your honour, and people are talking about you, the life you lead and the impact you had upon them. As you reflect, notice how you are feeling as your inner wisdom speaks to you. These answers will give you some insight on the legacy you want to leave behind. These answers will give you an important insight on what you would like your life to be about. The next step is to notice where you currently are. Are you living a life that reflects this vision? If so, what is it that you are already doing? Make sure to make a note of this; it will help you to begin formulating your vision at the next stage. Now that you have an idea of the legacy you wish to leave behind, it is time to begin building a compelling vision statement. This process can take some time, but it can be a lot of fun. I suggest that you ask someone who you trust to help you with this part. Sit down together and allow your partner to ask you some questions around what you noticed in your visualisation. What were you doing? What kind of difference were you making? Ask him or her to jot down the key value words that come out. There could be a big range, so just allow the words to flow. For example, you may notice words such as inspire, enhance, help, teamwork, passion, creativity, etc. There may be things like “make a difference” or “helping the community”. Remember that this isn’t about the specific actions you were taking, but more about the impact you were having on those around you and the world. You want to notice the bigger, value words. A life vision applies to all the areas of your life. It isn’t about one task or group; it is about expressing your vision through whatever it is that you do. Don’t worry if you find this challenging at first. You will get the hang of it. Just keep going back till you find words that start to feel right for you. The next step is to bring these words together in a statement of no more than 10 words. This may be more challenging than it initially seems, but keep going until you come to something that really inspires you. For example,”I live to create positive change and enhance potential” or “I live to create happy moments through expressing my art” are just a few examples to get you thinking along these lines. The next important step is to make your statement come alive. Until now, your life vision is a wonderful idea and a statement that calls you to act. But we need more than this; we need actual representations of what living our vision would look like in all areas of our life. For example, how you make people happy in your personal life would be very different to how you bring happiness through the product or service you deliver. Begin to look for pictures that represent how you would like to express your vision. These pictures can be of anything; all they need to do is represent your vision for you. Buy a poster board and put it where you can see it regularly and start posting these pictures. You can keep adding to your vision board as you go along. Not only will this process be fun, but it will allow your mind to start looking for avenues on how you can truly begin to express your life purpose, In sha Allah. Another practical step that is important to take is to brainstorm some practical action steps that you will take to express your life purpose. Think about two or three things you can do at work, at home and with friends or family. Plan some actions out and share them with people you trust. Let them know what you are up to, share your inspiration with them and In sha Allah they will support you in making it come to life. Of course, the most important thing to remember is that if you find that something isn’t quite working, then go back to the previous steps and play around with them till you get to what feels right. If something doesn’t feel right then it probably isn’t. Be brave and work on it till it feels congruent with your values and who you are as an individual. I hope that you will find this journey rewarding and enjoyable. 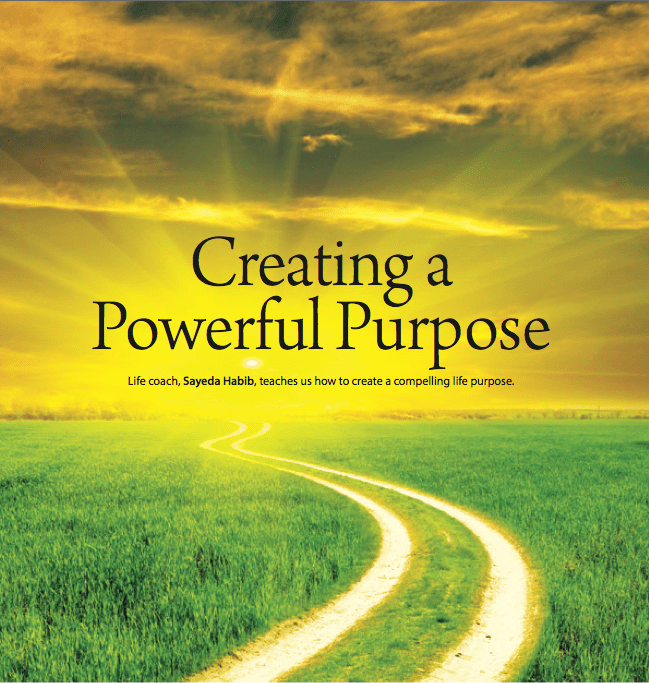 Having a purpose that inspires us makes all the difference in the quality of life that we lead. My very best wishes to you on this very important journey! This article originally appeared in Issue #50 of SISTERS Magazine, the international magazine for fabulous Muslim women co-founded and edited by Na’ima B. Robert, author of From My Sisters’ Lips.